Since posting my Kickstarter campaign, I’ve received a number of emails asking how I went about printing my children’s book in an eco-friendly manner. In all honesty, printing Falafel’s Garden was the single most frustrating experience I’ve had since starting my business, and I wasn’t exactly sure how to respond to people’s questions initially. The process was a lot more complicated and stressful than I had imagined and left me tearing my hair out at times. I didn’t want to turn anyone off to the idea of eco-friendly printing, but I also didn’t want to underplay the fact that printing an eco-friendly book requires a significantly larger amount of work than printing a standard book. As I continued receiving emails with the same question, I realized it might be good idea to share my experience. My hope for writing this post is to help authors know what to look for when starting the search for an eco-friendly printer and to hopefully encourage more people to take even small steps toward greener printing. The more self-publishing authors demand higher standards for printing, the more pressure there will be for large publishers to follow suit. Finding a traditional publisher or a self-publishing service that offers more than just FSC certified paper (or in the rare instance, partial recycled content), is a tall order, as I found out. I knew I wanted to print domestically on 100% post-consumer waste recycled paper using vegetable-based inks. After weeks of searching with no luck, I resorted to the old-school method of self-publishing by finding my own printer and handling all the self-publishing steps on my own. I began contacting printers while I was still writing my book, thinking surely that would leave me well-prepared. I spent dozens of hours researching and talking with printers and finally settled on a printer a few months into working on the book. I planned the release of my book according to the printer’s schedule. The first proof of the book I received had a number of glaring issues—the images did not line up from page to page, the color was way off, and the proof did not match the quality of any of the samples the printer had sent me previously. After editing the files to compensate for color issues on the printer’s end and paying for new proofs two more times, I finally realized that I was not going to get a satisfactory product from them. After some scrambling, I was able to find another eco-friendly printer who set me at ease by promising they could print my book as I wanted before my publication date. They sent me a proof of my book within a few days, and it looked significantly better than the proofs from the first printer. Unfortunately, the second proof was not as great, and then things started to fall apart as far as meeting deadlines and being able to print on the brand of paper that was promised. The printer ended up calling me right before my book was supposed to go to press to say they couldn’t print my book on their offset press by my deadline. In order to have books before Christmas (and at that point to make sure I didn’t have 1,500 books that weren’t to my standard), I ended up printing a smaller quantity on their digital press. The cost per book went up over $3. I had already settled on a retail price of $11.95 and knew that I would have trouble selling my book at a higher price. I ultimately decided to stick with the $11.95 retail price and only sell my book on my website, Etsy, and at a few local retailers who understood my situation. I was unable to sell my book with Amazon or Barnes & Noble as I had hoped due to my margins not being high enough. I don’t want anyone else to have the experience I did with printing an eco-friendly book, so I’ve gathered my best tips for the process from start to finish. Every printer has different requirements for color profiles, bleed lines, etc., and many do not offer the same book sizes or binding options. Securing a printer before creating illustrations or planning the layout of your book can potentially save you the unnecessary frustration of having to crop your illustrations or reformat your files. There are fewer options when it comes to recycled paper brands and green printing processes, so it’s even more crucial that you know your printer’s requirements before investing time or money on illustrations. I wasted a lot of time editing my files when I switched printers. The first printer required CMYK, while the second required RGB. Both printers also had different bleed lines, cut lines, and score lines and used different papers with different thicknesses (more about that in tip #3), which completely changed the dimensions of the illustrations. So before starting on any artwork for your book, I highly recommend requesting print samples of books comparable to yours and, if at all possible, speaking with someone who has actually worked with your printer. This will help reduce your chances of being disappointed or needing to find a new printer later on. You can oversee every step of the process and avoid paying to ship every proof (this gets expensive very quickly). There’s a good chance something will not turn out the way you expect, and it’s much easier to handle those issues in person. You can potentially save a ton of money on shipping. The cost of printing your book at a local printer might be more expensive, but the final cost (after paying for shipping of proofs and the final books) could potentially be cheaper than working with a printer across the country. You get to support your local economy 😀. You’ll likely have a smaller environmental footprint in terms of shipping (and potentially packaging). If green and local printing ends up being out of your price-point, I would still recommend trying to print domestically. By working with a domestic printer, you can potentially avoid issues such as lack of transparency with labor and environmental protection practices, language barriers, delays in shipment due to books being held up in customs, etc. While I would not recommend either of the printers I worked with, I know some of you will want at least one suggestion for where to look, aside from local printers. I can say that I received excellent customer service from Plan It Green Printing. I did not use them for printing my book, so I can’t attest to what it’s like to work with them start-to-finish on a book. But they were great about giving me reasonable quotes in a timely manner and answering all of my questions—plus, they did a great job printing Squickerwonkers by Evangeline Lilly on 100% PCW paper using vegetable-based inks. Don’t bother with printers who won’t send you free samples or accommodate you to come in and view samples. 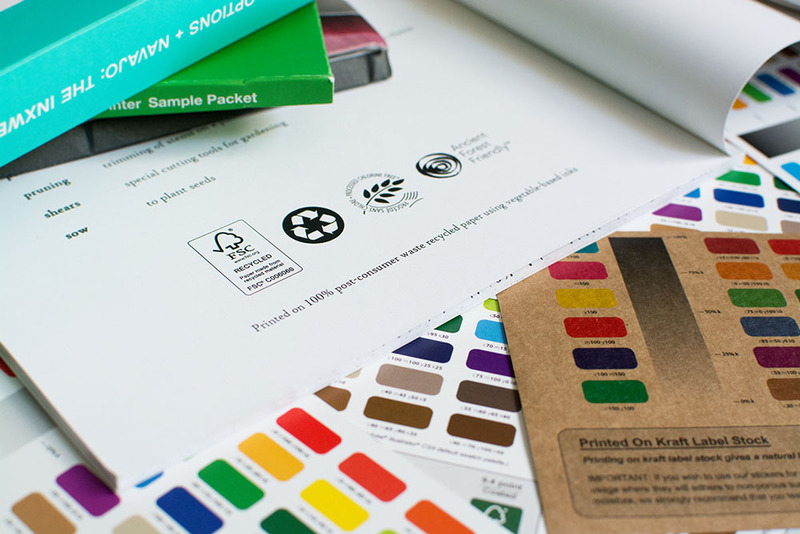 It’s essential for you to see and feel the different types of paper, finishes, binding options, and samples of print work before deciding on a printer. 100% PCW (Post-Consumer Waste) Recycled — 100% recycled paper is not necessarily 100% post-consumer waste recycled paper, so it’s important to ask about the PCW content. From my understanding, 100% PCW recycled paper is only available uncoated (without a glossy or matte/satin finish). While uncoated paper is better for the environment, you can find coated paper with a lower recycled content if having coated paper is important to you. 100% PCF (Processed Chlorine Free) — You may see paper labeled as “chlorine free” or ECF (Elementally Chlorine Free), but it is not the same as Processed Chlorine Free (PCF). Paper that is bleached with chlorine dioxide is considered ECF, but it can still form dioxin when mixed with other chemicals. PCF is the more eco-friendly option. FSC (Forest Stewardship Council) Certified — FSC certification shows that the paper comes from responsibly managed forests, but it has nothing to do with the recycled content. 100% FSC certified paper can still be 100% virgin paper. Paper comes in weights indicated by lb (#) and in two different categories—cover and text. Cover is thicker—I used 110# cover paper for the cover and 65# cover paper for the text of my book. But with some paper brands, you can use as thin as 80# text paper for the inside pages of a picture book and still have decent results. Since I went with uncoated paper, I chose to use cover paper for the inside pages of my book to ensure they were sturdy. Some of the recycled paper lines I looked at were Rolland EviroPrint and EnviroSatin, Neenah ENVIRONMENT, New Leaf Reincarnation, and Mohawk Options. Recycled paper can vary greatly in price and quality, and not all printers will be able print on the same brand of paper—I learned that the hard way with the second printer I worked with. They were unable to print on the paper I had chosen to use with my first printer, so I had to select new paper. Due to poor planning on the printer’s behalf, they had to change the paper brand three times. Each brand of paper had a different thickness, which altered the spine width and required me to re-crop the cover artwork. For some, that may not be a big issue, but I had set up my photographs to be the exact dimensions required for the first printer. 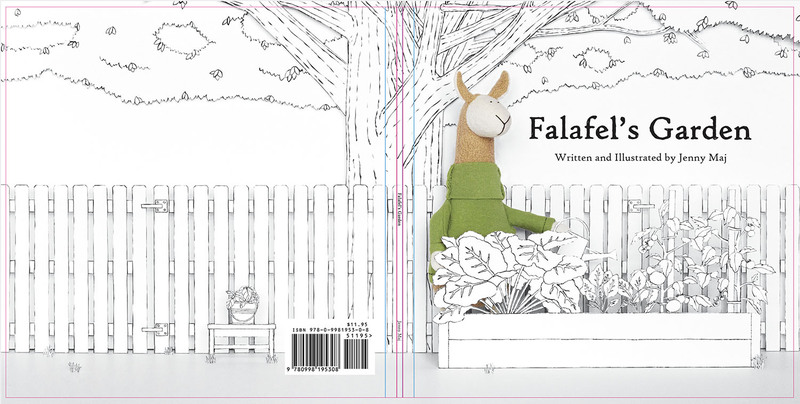 On the cover, I had a very tight space where I needed to stagger a fencepost over the spine to leave room for the spine title, and I needed to make sure the llama and planter box weren’t too close to the edges. The difference in bleed, cut, and score lines in addition to the change in spine width caused me to crop the cover art differently than I had wanted. Bleed, cut, and score lines for my cover. I had initially planned to include the eco logos on the back cover, but the changes in cover dimensions from one printer to the next required me to move the logos inside the book. It’s unreal how much costs can differ from printer to printer and from quantity to quantity. A quote for the same book at the same printer can vary dramatically simply based on the type of press they use. Digital printing, which uses a printing process similar to an office printer, is the cheapest option for small print quantities. (Many Print On Demand printers will only offer digital printing.) Offset printing requires the creation of metal plates to transfer the images onto paper. These metal plates are why offset printing is astronomically expensive if you order a low quantity of books. But the price drops dramatically once you reach a certain point. Even if you plan to print a small quantity of books, I recommend requesting the price of a minimum offset order if your printer offers offset printing. It may be worth buying more books than you had intended if the price per book drops enough on offset. When I initially started requesting quotes, I was set on having a square, hardcover book with uncoated pages and a matte finish cover. The initial quotes I received for 500 books ranged anywhere from $10.71 to $49.66 per book (not including shipping). The lowest quote was from the first printer I worked with, and I now understand why their prices were so low—the quality was poor. I ended up printing my book softcover because the cost of hardcover with the second printer was about $6 more per book than the first printer. The new printer gave me a quote for softcover of $4.17 per book for 1,500 books printed offset. But as I mentioned before, having to switch to the digital press at the last minute caused the cost per book to shoot up to over $7. Have you ever cracked open a new book and crinkled your nose at the strong, chemical smell? Chances are the ink in that book was petroleum-based and was offgassing VOCs (volatile organic compounds). VOCs aren’t just released during the printing process—they break down over time and can be inhaled each time a book is opened. When discussing inks with your printer, you’ll want to find out if they offer low VOC inks. Choosing a lower VOC ink is beneficial not just to the environment, it’s better for anyone who comes in contact with your book, including the printers and your readers. There are so many different types of inks and printing processes that it’s nearly impossible to determine the level of eco-friendliness a printer can provide without first talking with them. You may find that some printers are not as green as you thought, and others—while they may not offer the newest eco-friendly ink options—offer a different printing process that provides other environmental benefits. You may also find that some printers’ eco-friendly options may change from digital to offset. Some of the printers I contacted who advertised vegetable-based inks only offered them for off-set printing and used petroleum-based toner for their digital press. Certain soy and vegetable-based inks (e.g. linseed, castor, canola, safflower, etc.) can have extremely low VOC levels. Vegetable oils are also renewable resources, unlike petroleum. But even vegetable inks are not infallible. They’re certainly an improvement over petroleum-based inks, but many of them, particularly soybean oil-based, are often made with GMOs and monocultures, which are detrimental to the environment in a different way. There are other low VOC ink options, such as UV printing. UV ink does not dry in the air and emits almost no VOCs, but UV printing involves a polymerization process that must meet special requirements for safety, environmental compliance, and print room ventilation; and it consumes a greater amount of energy for the use of UV-curing lamps. In my research of UV inks, I found a decent amount of speculation as to whether it’s even appropriate to label them as eco-friendly. Inks are just one aspect of printing that have an environmental impact. You’ll want to look for printers who also focus on water and energy conservation, pollution prevention, and solid waste reduction and recycling (some printers recycle unused inks and printing plates in addition to paper). I am sure I have in no way exhausted the list of options when it comes to printing, so I can’t stress enough the importance of talking with potential printers and researching the printing methods they offer before making a decision. Much in the way the term “natural” has been abused in the food and body care product industry, there is no governing entity regulating the use of the term “eco-friendly.” I’ve seen everyone from large corporations to small handmade businesses label their products as eco-friendly when they’re not, and it’s beyond frustrating. Nothing is more detrimental to the advancement of sustainable products and production methods than businesses who greenwash (exaggerate the eco-friendliness of their products) and undercut the prices of companies who actually are making the effort to be eco-friendly. When you talk with printers about their green offerings, use your best judgment. If something doesn’t seem right, listen to your gut. It’s unlikely that you will be able to sell your book at the same price point as traditionally printed books if you choose to print your book domestically with an eco-friendly printer. There’s a reason why most books are printed on virgin paper in overseas factories (some that often have poor working conditions for their employees and no environmental regulations)—you can’t beat the price. 7- Show the World Your Book is Eco-friendly! If you are going to go through all of the trouble of printing an environmentally friendly book, make sure your potential customers know why your book is special! 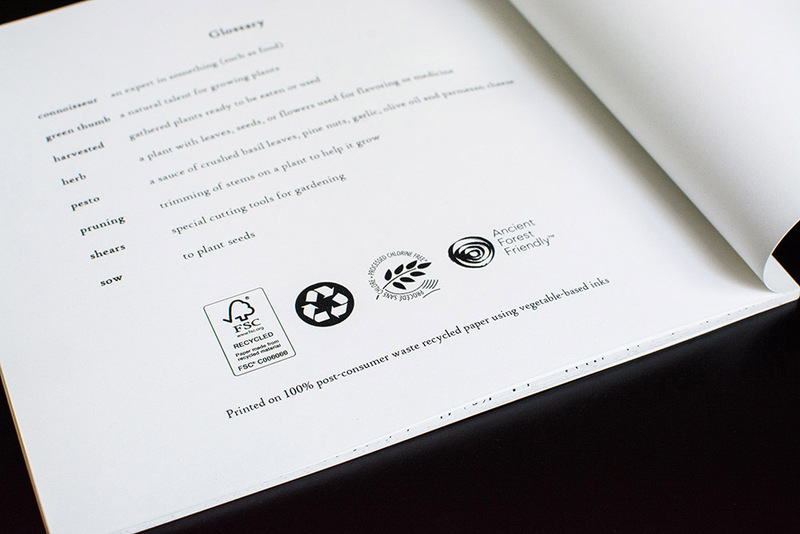 If your printer is FSC certified (or has any other green certifications), they should be able to provide you with their certification logos to print on your book. Also, request permission to use eco-friendly logos from the paper company you choose. Environmental benefits may vary even within the same brand of paper, so be sure to request the logos for your exact paper and specify the percentage of recycled content. The eco logos for my book. When trying to create an eco-friendly and/or ethically made product, it’s important to remember that Rome wasn’t built in a day. It’s easy to get caught up in trying to have a perfectly green and ethical product, but try not to be too hard on yourself. It will take time before eco-friendly printing is affordable and available to everyone. Maybe using 30% PCW recycled paper or just working with a local printer is the best you can do for this particular book. At the end of the day, just do the best you can. Even small steps toward green and local printing makes a difference. As long as you’re honest with your customers, they’ll appreciate you making an effort to give them a better product. At some point in time I’d love to do a second printing of my book, but I don’t know that I’m ready to take on possibly having to reformat my book for a new printer. I’m down to my last box of copies of my book, so I’ve opted to also offer my book in ebook format for the foreseeable future. Next week I’ll be sharing a list of steps for self-publishing your book! Have you had a great experience with an eco-friendly printer? Feel free to share it in the comments! This is FANTASTIC advice, thank you so much!! Thank you so much, Sarah! I’m glad you found the post helpful! Thank you! I’m releasing my book into the waters and having printers issues so this is so helpful. I’m glad you found it helpful, Natalie! Thanks for the great info! I’m still not sure if I will self-publish or go with a traditional publisher (we will try!) Eco-friendly printing would be so awesome! You’re so welcome, Cristina! Best of luck with your book! Traveling the same path. Thanks for sharing your experience. Wish it wasn’t so difficult, but have to work to make the change we hope to see.